Come meet horses in their natural environment and experience a new way towards inner peace, confidence, and strength. Not only will you spend time practicing restorative yoga and mindfulness meditation, but you'll also be able to learn about yourself by spending time with horses. Thanks to the horses' ability to recognize emotions, fears, and blockages, you will get insight on how to live with more harmony! Appropriate for beginner or intermediate level yoga and meditation practitioners. Half-day is 100% unmounted. Yoga & Horses Mini-Retreats are available on select Saturday afternoons, for $75/person. Groups are limited to no more than 10 persons. Full refund if you cancel with more than 30 days notice. Within 30 days of the event, we will keep $35 to cover administrative fees. Facilitated by: Shannon Knapp, Mindfulness Based Stress Reduction (MBSR) trained, and Katie Hadden, RYT 200hr. Join us for a full day version of our Horse and Yoga Retreat where you’ll spend the day on the beautiful farm at Horse Sense of the Carolinas connecting deeper with yourself, each other, and our horse partners. We will start our day in the Pavilion with a gentle mat yoga practice designed to restore and center. Guided meditation and time walking the labyrinth will follow as we continue to settle and connect with self in a quiet, serene outdoor setting void of the noise and distraction of daily life. The afternoon will guide us into intentional learning opportunities with the horses followed by a hands on yoga practice with your horse partner first on the ground, and then on horseback as we continue to explore our level of connection. This day offers time to disengage from the rushed routines of life, experience meaningful interactions, and explore your way forward through increased awareness and connection. We look forward to practicing with you! Appropriate for beginner or intermediate level yoga and meditation practitioners. Full day offers option of mounted yoga. Yoga & Horses Full Day Retreats cost $150/person. Groups are limited to no more than 8 persons. Within 30 days of the event, we will keep $65 to cover administrative fees. With less one week notice, no refund is available. Katie Hadden is a Registered Yoga Teacher, 200 and currently teaches in the community at Asheville Community Yoga and through her practice, Harmony Way Yoga. Katie incorporates all aspects of yoga into her practices blending the physical postures with mindful practices, breathing exercises, and awareness of living a yoga lifestyle. She has been a lifelong horse lover and began teaching riding lessons in 2002. She then became CHA and PATH certified and spent 8 years teaching therapeutic horseback riding lessons before leaving that to return to graduate school. 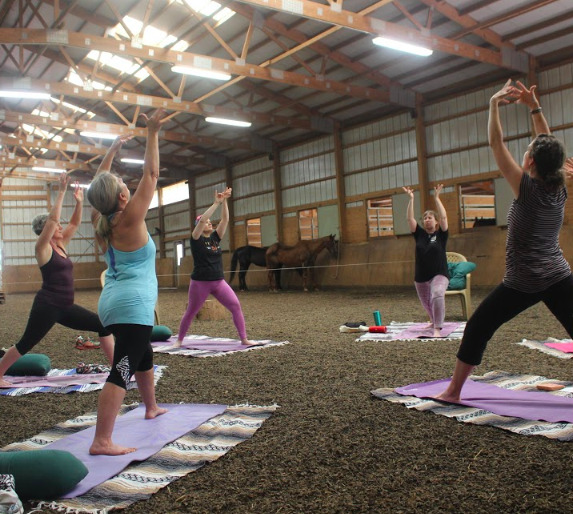 Equine yoga is a natural combination of her background with horses and yoga and offers an opportunity for meaningful connection and support for your mind, body, and soul. She finds joy being a mom, tending the earth in her garden, exploring the natural world, and spending time with friends and family. Her creative and artistic spirit provides hobbies she enjoys including pottery, photography, playing violin, sewing, and crafts and also brings laughter and fun to her world. 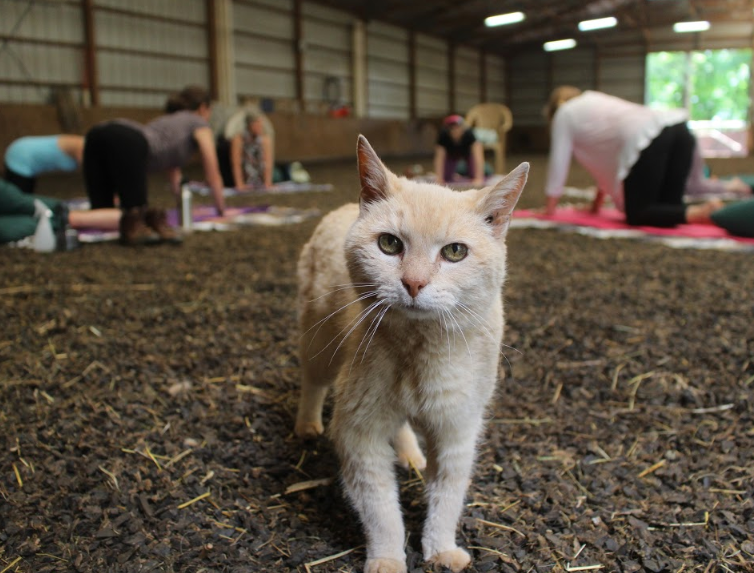 She enjoys spending time in community and is honored to share yoga with you!